Over the past year as more U.S. consumers have adopted smartphones — more than half of the population now uses one — the number of installed applications is up for both Android(s goog) and iOS(s aapl) devices. Yet the amount of time spent using those applications hasn’t changed much, says Nielsen. In 2011, the average amount of time in apps was 37 minutes per day; a year later, it’s just 39 minutes, indicating that developers might be challenged when it comes to increasing application engagement. The average number of installed applications has jumped to from 32 to 41, which is a 28 percent increase. 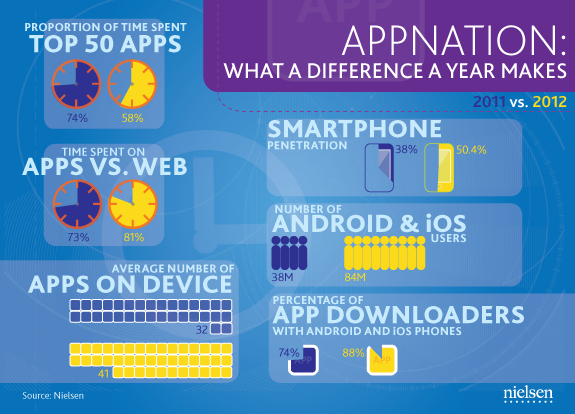 So why hasn’t the amount of time using smartphone apps jumped nearly the same amount? Right off the bat, Nielsen says the top 50 apps commands up to 58 percent of all app use. The overall top five apps — likely to account for a good chunk of app usage — are the same as the last time Nielsen offered up its “State of the Appnation” view: Facebook, YouTube(s goog), Android Market, Google Search, and Gmail. Four Google apps may sound like much given the popularity of the iPhone, but Android does account for more smartphone market share than iOS. This heavy usage of the top 50 apps — even though it’s lower than a year ago — doesn’t leave much time for a developer to grab attention from smartphone users, even though overall app installations are up. Putting Nielsen’s numbers in another light: Consumers are spending less time with each app on average. Depends on what you are doing. For business users, a well developed app means the user needs less time to accomplish the same task. Only for games and non-important use would more time spent mean better. Less time is a sign of progress when using your phone for needed thing vs. entertainment. The race is no longer to create a great app, but rather find ways to be included or found in top 50 app content.